1537 Earliest record of a mill in Deal. The Foche family possessed land including Deal mill. 1596 Depicted on Symonson’s Map. 1740 Owned by a widow, Mrs. Matson and subsequently in possession of the Matson family into the early 1890’s. 1787 Sandown mill constructed by Thomas Oakley to break the local milling cartel charging high prices to the ships, but neglecting the poor. 1804 Corn Laws in force to protect domestic farmers against foreign competition by imposition of heavy duty on foreign corn. Repealed 1846. Napoleonic wars brought the threat of invasion. 1855 New smock mill built by Messrs. Sweetlove of Wingham, to rear of present St Richard’s Church on the instruction of Mrs. Matson, for her son, to replace the old post mill which was nearer the waterworks. 1910 Ernest Fuller hired the mill from a Mr. Parker, and was probably the last to work it. 1913 The mill was struck by lightning and partially destroyed, but saved by the prompt action of employees. 1929 The mill was demolished in March. The site was acquired by Snowdown and Betteshanger Tenants Ltd. for the development of an estate of miners’ dwellings. The first record of a mill in Upper Deal indicates that there was one here as early as 1537. It was a post mill. This became one of seven mills, all now demolished, which flourished in the town, with easy access to grain from the countryside and sea winds. The numerous naval and merchant boats at anchor in the Downs provided profitable business opportunities for the millers who provided flour and bread. The Chitty and Matson families in particular, had long connections with milling locally. In 1885 the new mill replaced the old one. This was an octagonal smock mill, on a stage, with 3 pairs of stones. These stones turned 12 times to one revolution of the sweeps, the local name for sails, giving it a ‘solemn’ demeanour with its output of 20 hp. It stood on the highest ground of Deal, with the advantages of catching wind from all directions. It was one of the last mills to be built in Kent, and worthily demonstrated the ’art and craft of the millwright’. A lightning strike of 1913 caused some damage, but it was in ‘good working order and ready for immediate use’ when auctioned in 1928. However, in 1929 it was demolished to make way for the housing for miners working in the recently opened Kent coalfields. 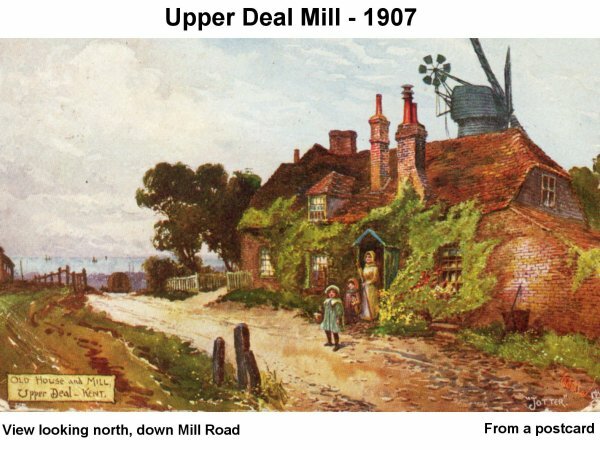 The Upper Deal Mill, which, with Wellington mill at the bottom, gave the name to the hill on which it stood, became both the first and last mill of Deal.